Once again back with process improvement topic, when we though of process oriented organization, few of us think that it can be achieved easily but believe me it don’t happens over the night. There are teams who sweats day & night to establish a formal process and in every organizations there are people who don’t like changes but change in inevitable in nature and we must be ready for the same. 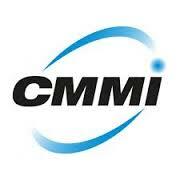 CMMI is a framework for process improvement and today we are going to categories CMMI processes area. Further if we categories maturity level, it can be divided into 5 maturity level. Any company or organization which is having no process is by default at level 1. If you have counted there are 22 process areas and each represent some activity in Maturity Level. 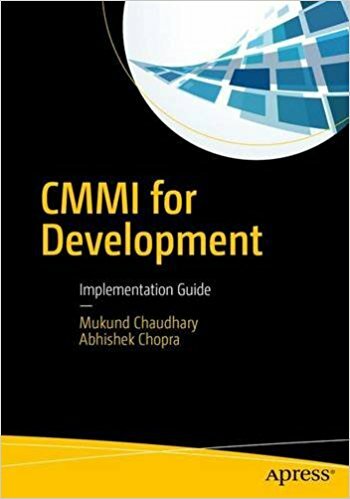 If you want to learn more about these areas, I would encourage you to read my book on CMMI for Development. If you are looking to hire an consultant for CMMI implementation, you can reach me on mukund002(at)gmail.com. Today I am going to focus on the major misconceptions that people have about PCI. So before getting started with the misconceptions, lets understand what is PCI & to whom it applies. The Payment Card Industry Data Security Standard (PCI DSS) is a set of security standards designed to ensure that all the companies that accept, process, store or transmit credit card information maintain a secure environment. The PCI Security Standards Council is a global forum for the ongoing development, enhancement, storage, dissemination and implementation of security standards for account data protection. The PCI DSS is administered and managed by the PCI SSC (www.pcisecuritystandards.org), an independent body that was created by the major payment card brands (Visa, MasterCard, American Express, Discover and JCB card.) Now since you have some knowledge about PCI, you might have understood that it applies to all the organizations regardless of their size or the number of transactions, that accepts, transmits or stores any cardholder data. Since we don’t store credit card information, we don’t have to be PCI compliant. This statement is false as PCI DSS does not only apply to the storage of credit card data but it also applies to the handling of data while it is processed or transmitted over networks. Since you are not storing credit card data it does eliminate compliance requirements as the majority of the controls dictated by the DSS remain in effect. The only way to avoid PCI compliance is to transfer the risk entirely to someone else, such as third party payment,for example; PayPal’s Website Payments Standard service where customers interact with the PayPal SDK directly and credit card information never traverses to own servers. The PCI Data Security Standards is only a recommendation and not a requirement. This is also a false statement. The Payment Card Industry Security Standards Council (PCI SSC) is a private regulatory body that enforce the PCI DSS standard for merchants and service providers, regardless of their number & size. If the company stores, processes, or transmits any of the information recorded on a credit or debit card then they must abide by the PCI DSS else they have to face significant fines, higher opex costs through increased compliance requirements, and potential suspension or expulsion from card processing networks. Since we process a few number of credit cards only, so we don’t have to be compliant. Again a false statement. The merchants who process less than 20k transactions a year is not bound to seek the compliance validation but the obligations of PCI compliance is still there as the data you store can be compromised and have serious consequences. Since we use PayPal/Authorize.NET therefore we don’t have to be PCI complaint. People often thinks that we have transferred the burden of PCI compliance to the payment services provider but there are certain services (e.g. PayPal’s Website Payments Pro).If your website integrates with PayPal via an API then you are still liable for PCI compliance since your servers capture and transmit the credit card data first. PCI compliance only applies to eCommerce. The compliance is not applicable to any particular domain and hence it is applicable to every domain including eCommerce. There are lots of other misconceptions about PCI which are not listed in this post. The purpose of the post is to share the general information and misconceptions of payment compliance. Please do share your feedback about this post. In Today’s modern era security is still a big challenge for any sized organizations until you don’t have some form of control in place. These controls are necessary as information is one of the most valuable assets that a business owns. If you are IT services Provider and handling customers information then you must have to use security techniques such as Information Security Management System (ISMS). In Layman term, ISMS is a framework of policies and procedures that include all legal, physical and technical controls involved in overall organization’s information risk management processes. Let us now move to the main focus area of this post which is planning & implementing ISO 27001. Internal Cost, such as resource cost including HR function, IT function, and support functions. External Cost, such as consultants cost and this would be again to minimize the efforts required and reduce the cost. Certification Cost, this is one of the costs which cannot be reduced as there are few companies providing certification and one has to pay the certification cost certifying bodies. Implementation Cost, this can be analyzed by gap analysis and risk assessment procedure. Another question may arise in your mind, how much time is required to complete this certification? On an average, the time four to nine months is required depending on how mature an organization is in term of Information security, and size & nature of the organizations. 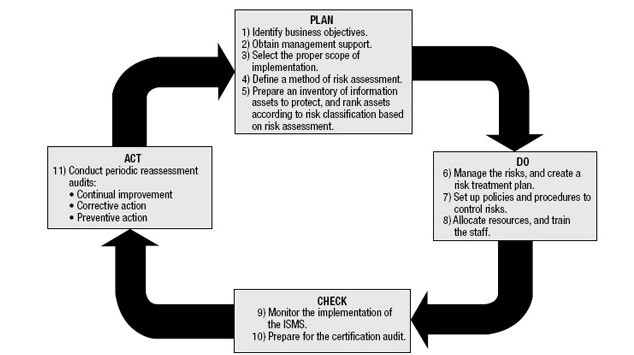 As any standard practice, ISO 27001 requires a company to establish, implement and maintain a continuous improvement approach to manage its ISMS and it follows Plan-do-check-act (PDCA) Cycle. Phase 3—Select the Proper Scope of Implementation. Phase 4—Define a Method of Risk Assessment. Phase 5—Prepare an Inventory of Information Assets to Protect, and Rank Assets According to Risk and Classification Based on Risk Assessment. Phase 6—Manage the Risks, and Create a Risk Treatment Plan. Phase 7—Set Up Policies and Procedures to Control Risks. Phase 8—Allocate Resources, and Train the Staff. Phase 9—Monitor the Implementation of the ISMS. Phase 10—Prepare for the Certification Audit. Conclusion: The success of ISO 27001 is its alignment with the business objectives and effectiveness in realizing those objectives. IT and other departments/functions play an important role in the implementation phase. An organization also needs to have the detailed understanding of PDCA implementation phases. In the next article in the same series, I’ll try to explain each phases mentioned in PDCA Cycle and highlights on the importance of ISO 27001. Thanks for reading this article, share your views. Today I am going to explain, how you can integrate PayUmoney in your custom PHP based website. In initial stage of plan to integrate PayUmoney to the website seems to be little confusing to those who are not doing regular coding but once you get involved, it seems to be easy one. If you have gone through the technical document of PayUmoney, then most of the things are clearly mentioned as easy to understand. Go to https://test.payumoney.com/ and sign up as a merchant account. At time of sign up you need to use your valid email id. Then fill all required business details. Use this details for PAN no. ABCDE1234F (use your PAN Number) and DOB – (dd/mm/yyyy) . Add your bank detail, note you can add whatever bank name and details use this IFSC – ALLA0212632 in place of IFSC. Don’t worry about bank details verification as you know this is your test account only. Once your required steps are completed and your account is live,then write mail to support team : (techsupport@payumoney.com) for activating your account and to provide salt key. Now after activation you can get your key go to Manage Account ⇒ My Account ⇒ Merchant -Key Salt copy your key and paste in your code. After receiving you salt key, you are ready to test the code which can be downloaded from PayUmoney site also. I hope following these easy steps, you can easily integrate PayUmoney to your website. Note:- Don’t forget to change the Merchant Key & Salt in the code. SCORM is short for Shared Content Object Reference Model. As then name implies it is a Reference Model for creating SCO’s for creating web based training that is able to be shared among other SCORM complaint LMS or content delivery system. In simple words SCORM is standard to be followed for delivering content, if you follow the standard then only one time content investment for you. Re-usability: The flexibility or ability to incorporate course material in multiple instructions. Interoperability: The ability to take course material developed in one location with one set of platform and use them in other set of tools and platform with different location. Accessibility: The ability to access and locate course material from location and deliver them in multiple locations. 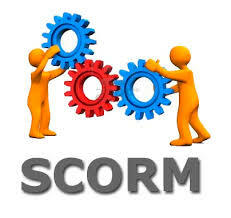 Now you have some basic understanding of SCORM and lets quickly move to its sub specification which will help you in understanding it in detail. The Content Aggregation: The content Aggregation Model is based on XML and specifies how Scorum content should be described and aggregated which promotes consistent storage, lebeling and packaging. This model uses mainly three technologies namely ‘Content Model‘ which help in creating learning experience and explains how these componets can be organised. Second is Metadata which describes the nature & purpose of package and the third one is ‘Content Packaging‘ is the collection of all files required to run the content and it enables learning to be shared between tools and system. Sequencing & Navigation: Sequencing and Navigation specifies the rules by which a learner cab navigate between shared content. SCORM sequencing is generally based on concept of Activity tree where rules are attached to each content for sequencing and navigation defines how learning contents events are triggered. Most of the things are clear so lets quickly move to its implementation part. The first thing we need to understand the every implementation vary depending upon what you are trying to implement and you need to determine whether you site is eLearning or just content delivery site. Let us see we an example where you want built a SCORM player in PHP. An importer, that reads XML from the imsmanifest.xml file and creates a representation in your system, if needed. The most important thing in this file is to find the “launch point” of the SCORM content. The second bullet points mentioned above is the most important and difficult portion. I have mentioned the steps for beginners and I can tell you that implementing SCORM from scratch is difficult as you need to work on lots on API to connect with different vendors. Career Change is very important to learn new thing and to find a significant growth. Everyone has a different thinking on this but there is a common six reason to make a career change. Knowing all the reasons exactly means you can address each one of them directly.